Modern electronic products have complex designs, intricate construction, and complete more sophisticated tasks than ever before. However, most electronic systems won’t function properly without the right programming. At Levison Enterprises, we offer programming services to our clients to ensure the products they order from us are ready to perform. Components must meet their required performance standards while maintaining compatibility with a finished product, and our quality control process helps ensure no cycle faces delays due to programming issues. Customers of Levison Enterprises know how seriously we take customer satisfaction and quality control. The modern electronics market is extremely fast-paced and competitive, and we judge our success by that of our customers’. This means we go to great lengths to ensure the products we design are functional, reliable, and meet all of our clients’ performance standards. From design to programming, every project undergoes rigorous testing at every level to ensure we catch problems before they negatively impact a project. When it comes to programming, our team has the experience and certifications necessary to ensure your products meet all of your specifications. At Levison Enterprises, we thoroughly test every programmable device to ensure compatibility, functionality, and reliability. We maintain certification with the latest compliance requirements to ensure our devices perform at the highest possible levels for today’s competitive market. Our in-house programming department works closely with clients on their projects and confirms project functionality with a wide variety of testing methods and equipment. When you have one contractor managing design, another handling production, and yet another taking care of programming, too many issues can get lost in translation. While it’s sometimes wise to let a project pass through many hands to gain a variety of different perspectives, other times too many hands on a project can create confusion and chaos. When you order printed circuit boards, electronic components, box builds, or electromechanical builds from Levison Enterprises, you can rest assured that our rigorous programming standards apply to every project we manage, and you’ll have access to our team throughout the entire project. We not only offer initial programming on your products and projects but also perform all of the required functionality tests to ensure your products perform up to your standards in a variety of situations and applications. You can reply on Levison Enterprises for much more than just manufacturing and programming. The variety of support services we offer enable you to cut save time and money compared to dealing with multiple vendors and suppliers. 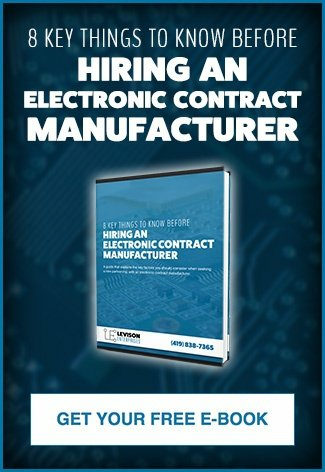 As a full-service electronic contract manufacturer, we provide outstanding electronic manufacturing backed by extensive quality control standards and testing protocols to ensure every project performs as required. In addition to our rigorous workflows, our customers receive stellar customer service in every interaction and a firm commitment to creating fantastic finished electronic products. Our supply chain management services also extend to product packaging and order fulfillment. Levison Enterprises is the best electronic contract manufacturer for your product. Contact us today and find out how we can help you with your next project.